The Atlantic Cities has set up shop for a while now and is pretty much all you could ever want to learn how to build a better city. Planetizen is also an excellent news aggregator. It's good to know what other cities are doing to try to improve themselves. "Municipalities in which the predominant land use is that of single families or other low-density forms of accommodation find that real-estate taxes simply don’t meet the cost of providing hard (street lighting, garbage pickup etc.) and soft (libraries, parks etc.) services. To continue building cities in this way can only plunge municipalities even deeper into debt. Given our constitutional constraints and the extent of low-density suburban growth already in place, how do we address this seemingly intractable condition? First, the federal government could review the way in which it has provided infrastructure funding, which has not been made on the basis of the most effective long-term benefits. In 1997, Ottawa created the Canada Foundation for Innovation, with $4-billion sequestered for health care and biomedical research. Applicants compete on the basis of objectives, means and targeted outcomes. The fund has attracted the very best from around the globe and stimulated research that brings kudos to Canada and will be of enormous benefit worldwide. An essential criterion might be to improve the modal split – that is, to increase the ratio of public ridership versus automobile use. Another might be to increase average residential density. (This wouldn’t mean no single-family housing, only a more balanced residential portfolio.) One result would be that investment in transit could pay its way. Second, the provinces could introduce full cost pricing. Currently, they fund expressways, water and sewage trunk services – in effect, subsidizing the developer at the expense of the city. Such a measure would benefit the city’s configuration and its servicing costs. And third, at the municipal level, improvements can be made through zoning and city bylaws. These could be rewritten, for example, to allow development of any land use, whether residential, commercial or industrial, only within 1,000 metres of a transit stop. This would tie land use and density to transportation capacity (Planning 101) and also ensure jobs accessibility and reduce commuting times. It also would encourage the integration of all modes of transportation across city regions." Answer: Subway. Rabba. Dry cleaners. Starbucks. Or a bank branch. Question: What retail inevitably shows up in a new condo development? In many threads on UT, forumers lament the ubiquity and lack of interesting, independent retail that pervades places like CityPlace, Southcore, and in other neighbourhoods with a new tower. We long for some variety and soul, like what you'd find along all of Queen Street, or Roncesvalles, or, of course, on Yonge Street. Why do these new retail spaces usually only have large chains? Occasionally you see some mom & pops open up, such as Crepes-a-go-go in 18 Yorkville or Red Rocket Coffee in Verve Condo on Wellesley. Why does this happen? As it turns out, this is neither a new phenomenon nor a Toronto only issue. So what this tells us is that we probably shouldn't worry too much about these new buildings and developments. They will likely come around and a street like Bremner Boulevard between the Air Canada Centre and the Rogers Centre will surely grow into a sports fan's paradise with unique bars and restaurants. Or the retail in all the new buildings along King St West will develop and cater to the expanding population there. We should also be careful not to place too high of expectations on the West Don Lands or Lower Bayfront communities. It may take time for these burgeoning neighbourhoods to settle beyond the inevitable Rabba, Subway, dry cleaners and Starbucks that will likely initially move in. We also need to keep pressure on developers and architects to ensure that the pedestrian level details are not overlooked and that the retail spaces are designed with great flexibility in mind. A good example of this is the Bloor Street frontage of One Bedford where there are entryways every 20-30 feet. Eventually that BMO branch or Shoppers might turn into five or six small independent boutique shops, extending Bloor's retail towards St. George Street. Will developers see the potential in ensuring that their buildings will support independent small business? Do buyers respond? Right now, condos downtown are being sold no matter what retail lies at pedestrian level. But that may not always be the case. There is great potential at Five Condo for reintegration of independent small businesses in the restored buildings along Yonge Street. The developer has hinted at such possibilities. The Distillery District is an excellent example of what can happen when chains are not allowed to come in to a new development. Well, the Distillery was not entirely new, of course. It had the rackhouses and other historic buildings that support Jacob's quote above: an immediate vibrant atmosphere was created by lots of artists, galleries, and restaurants that reused these old buildings. And the condo sales followed. Cities need old buildings and eventually our current crop will be the old ones. Perhaps there is hope for CityPlace after all. Should Toronto Protect its View Corridors? An article I wrote for UrbanToronto has been posted, titled "Should Toronto Protect its View Corridors?" 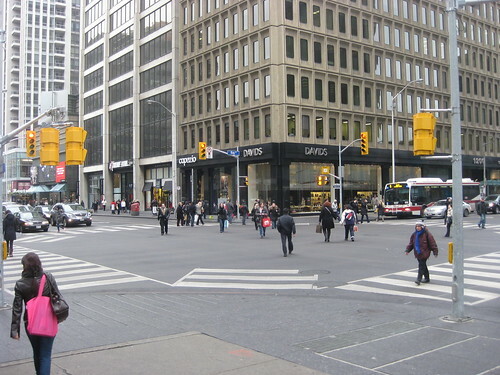 The Bay & Bloor intersection is the third intersection in Toronto feature the Pedestrian scramble. After auto and pedestrian traffic trades turns moving, there is a third pause which gives about 30 seconds for pedestrians to move across the intersection, including diagonally. This bit of urban infrastructure is very important especially in this area where the density is high for both offices and residences. There are always more people on foot than in cars in this area. Other candidates for scramble intersections that I think could benefit Toronto include Bay St & Dundas St, Yonge St & Queen St, and Avenue Road & Bloor St.
A massive fire this morning at the red brick 1888 heritage building at Yonge & Gould in downtown Toronto is a major disappointment. After water, gas, and electricity had been cut from the property, and after the owners had asked and then denied to demolish the building, one wonders if foul play is involved. The beautiful old building fell under "demolition by neglect". As part of the neglect, a part of a wall fell down in April 2010 that has caused hoarding to go up losing a car lane on Yonge and causing major pedestrian disruption along Yonge Street and Gould Street, a major entrance to Ryerson University. The owners of the heritage building, the Lalani Group should be terribly ashamed. The Ontario Heritage Act was created to avoid these situations, and the city and province should uphold the law and make the owners pay for this. It is not acceptable. Nothing over three stories existed in this photo five years ago. 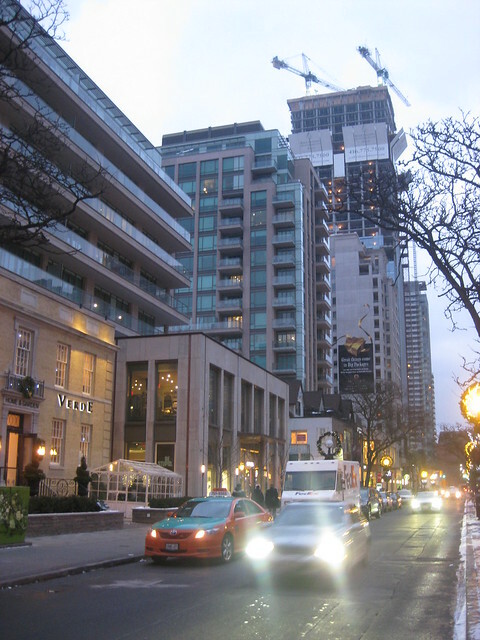 The Yorkville neighbourhood continues to grow more dense with multiple high-end condos. The building in the distance with the two cranes is the new Four Seasons Hotel, which will contain both hotel rooms and more condominium units. The neighbourhood's cozy streets filled with restaurants, boutique shopping and all the usual amenities one needs to live make it a great location, not to mention it sits above and around two subway lines. It's a great place for a pedestrian. Since the streets are so narrow, cars drive slowly.